It was clear and starry as we all descended on Lagganlia on Friday night. Saturday looked promising – cold and clear. The various groups of climbers set off early – Sylvian and Marcus, Alison and Kenny, Katrina and Chris and Tim, Martin and Paul made up the 4 climbing parties. They returned largely frustrated having taken their gear for a good walk in the main. Kenny and Alison achieved their target, returning latest having climbed fluted buttress direct after a bit of a wait at the start. Sylvian and Marcus marked Marcus’ first winter climb with a short day on Fiaciall Ridge and then onto Cairngorm. Katrina and Chris had a good walk and then retreated to the gear shops and the party of 3 (Tim, Martin and Paul) were on Jacob’s ladder where there was a lot of snow. Clare A went skiing and reported busy slopes and friendly queues. Claire, Antti and Emma had a good day on Carn Sgulan and A’Chailleach – 2 new munros for Emma and Antti and it seemed they were hard won with thigh deep snow and Antti ‘snow swimming’ at one point. Alison, Ken, Perry, Monty and Gordon all got a new Corbett – Carn an Fhreiceadain from Kingussie and sampled a local hostelry there before heading back. Fiona and Mike arrived on Saturday evening having finally had their bathroom plastered and after buying some new gear in Aviemore. Their liquorice sweet vodka was given a thumbs up by Antti and Paul’s date cake was also much enjoyed and complimented. Sunday saw a number of the group donning skis – Clare A, Monty, Claire H, Antti and Emma were all off sharp to get into the carpark. Claire H, Antti and Emma had a bit of a false start and had to retreat to collect gear at Glenmore Lodge but eventually enjoyed a good day on the slopes with superb views. 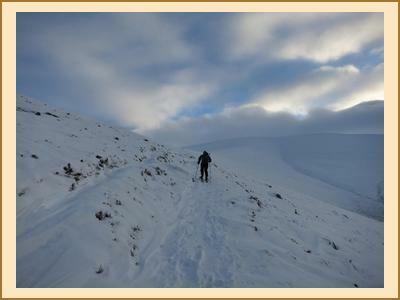 Fiona and Mike went off ski touring on Sgor Gaoith. Chris and Katrina headed for Carn an Fhreiceadain, in the knowledge that the trail up was broken and Tim also headed for a new Corbett, enjoying a quick traverse of Corriehabbie Hill in his crampons towards the top. 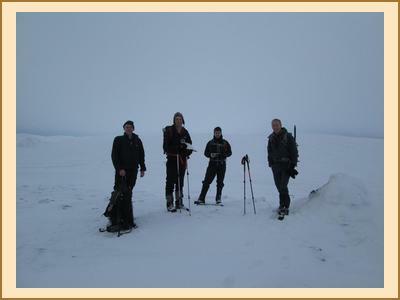 Alison C and Kenny planned a gentler day but still managed some snow shoeing up Airgiod-Meall from the sugar bowl. Alison, Ken, Perry, Martin, Paul and Gordon did a quick trip up Meall Chuaich on the way home – cold winds but a lovely clear walk out as it brightened up. Finally, Marcus was a bit under the weather so he and Sylvian did some shopping in Aviemore and headed home early. All in all a very successful meet with something in the area to suit everyone. Thanks all and look forward to the next one!